Here we are on the last day of the month. I sure got a lot accomplished this month in purging lots of things out of my house and donating to charity. I still have lots to purge out of the garage....but I'm doing well. The yard work is under way, I got a gardener to get things going for me. I've managed to make my bed every day, keep the counters clear and wiped off, laundry done and it has felt like a good month. Our whole family (Hubby, kids and I) worked on getting all of the house cleaned and straightened up for company. Hubby did most of the hard work (scrubbed the floors, cleaned the shower/tub) The kids did an amazing job cleaning up their rooms and helping us around the house. We were able to sit back and enjoy having everyone over for a bbq yesterday. Worked with my daughter in her room. We emptied her one dresser and got everything sorted, folded and reorganized. We also pulled out clothes that needed to be donated. Today, went through the closet and furniture in the guest room and purged old suitcases, clothes that are too small, and lots of extra bedding. Yesterday, I was able to go through a chest that I kept sweatshirts in and was able to purge four kitchen bags of sweatshirts. some of my clients got money from the city or county to make their yards more water saving. Thanks Fifi - I had a veggie garden a couple times and not much luck. For the past 5 years we have been in a severe drought in Southern Calif. The City has very tight watering regs and I have heard of people getting fines. Most of my neighbors have put in artificial grass - but I don't like the looks of that and there are some of them that are toxic to children because of the chemicals used in making them. Hey there Travelbug, noticed you are thinking about replanting your yard in lawn, and wondering have you considered planting it in flowering and fruiting plants that nourish birds and butterflies? I did this with a medium sized front yard and found it a delight to walk among landscape plants in the path to my door. The bonus is, no need to water and no need to mow! It,s surprising but true that you can manage a well planted yard in less time than it takes to mow. And the critters will thank you for it. put a bunch of stuff in recyclimg, organized 1 creisper drawer and the cabinet with baking suppylies and snacks. also wash all dishes before bed. Even if they will only offer an exchange, you'll probably get a good fit. Thanks IGNITEME101 - yes the Rx is correct. I have another pair with same Rx and just wanted a new pr. of glasses. Today is day 4 - picked them up on Monday eve. and have been back there 4 times trying to get correct/comfortable fit. Vision is great - fit is horrific. Thanks for info that they will take them back - I going there tomorrow !!! My current pr. are from my eye doc office and very $$$$, liked Costco price, but glasses are painful and I still have my daily crushing headache. I finally got a glasses adjustment from dept. manager (head technician) at my Costco. They will for the 1st few days, most are 30 days, especially since they don't fit correctly & they aren't able to correct it. Also, are you certain your script is right? I've had my share of mishaps regarding eyes/glasses, etc. Follow thru asap. Let us know, too, please? Haven't posted in a few days. But still keeping the house pretty organized. I now have the habit of throwing things in the trash or recycle immediately instead of setting things aside for later. I would like to return them and get a refund, but don't know if they will do that. Have 2 GRand children, 19 months & 44 months, today but got all done b4 7:00 a.m. Grateful for this site that taught me how to do it all! I'm on Nutrisystem and they deliver frozen food in huge Styrofoam boxes. Yesterday I got my forth monthly deliver and after I got done unpacking it and dragging the box out to the garage, I noticed I had bits of Styrofoam strewn through the living-room and the kitchen. Not sure why. It's a solid box. Annoying. Anyway, I vacuumed that mess up. Good morning. Imreite, one step at a time. Organization is never really 'done' per se, but making some headway in little ways every day sure feels great. My weekend task is our grill. It needs some serious attention. I have been struggliung with my cleaning organizatin goals. i planned some stuff for april and it is cloe to the end of may and they are still not done. i do feel like i may never catch up but i have started to develope some habits to make some of it easier. Yesterday I cleaned off the patio furniture and BBQ grill. Lots of pollen all over everything. Today I am going thru clothes for Goodwill. Yesterday I cleaned out those cup holders in the car between the front seats. Took a lot longer then I thought it would. Work in my office, processing paperwork/to do's, purging old paperwork, and planning for June. This morning I moved a bunch of Google documents and spreadsheets into appropriate folders so I can more easily find what I'm looking for. I love Google documents, spreadsheets, etc. Plus it's free. Today I will complete the 'finding a home for everything' job in my bedroom. If it means throwing it out because I don't know where to put it, I'll throw it out. Will be watching for a twin mattress sale, next. hoping to do some good work in my bedroom and walk in closet today. stayed home all day - the only thing I accomplished was to hire my neighbor's gardener to put new lawns in for me. He is going to use seed. Of course this will require a lot of water, but I read that they are lessening some of our restrictions. I'll have to quit feeding the birds in the canyon behind my house until the grass takes root. Wish me luck. Right now I have only brown dirt in the front and back and it looks terrible. All my neighbors have nice lawns - so that was my inspiration. Last load of laundry is in and bills are paid. Letha - When I get the white/soap/lime scum on stuff I soak it in vinegar and after about 1 hour the stuff just wipes right off.I would put a small amount is the bottom of each mason jar and it should just wipe right out. I've done it in the tubs, around faucets etc and it works like a charm. I read about it on the internet for cleaning tips. Good thing is that no "scrubbing" is required. Today I did a lot of yard-work, trimming, clipping, etc and filled by greenery bin for haul-away. I got a name of someone who may be able to fix my sprinklers and maybe help with yard-work. my neighbors use him and he does a good job. I also did 2 loads of laundry - finished and everything is put away.Now I am going to sit down and rest!! We keep our toothbrushes in a 1 pint mason jar on the bathroom counter. The bottom gradually builds up a white film so I gave the jar a good scrubbing this morning. Much better now. Cleaned out my nightstand drawer that was SO LONG overdue. I found expired infant gas relief drops that expired in 2009. Mind you, my youngest is 8 years old. Didn't take very long. I'm not sure why I put jobs like this off for so long. Made a huge step in the kitchen! Loving organization! Today I pulled some glass tumblers out of the kitchen cupboard that I haven't used in over a year and put them in the give away pile. Always good to free up space for things I use all the time. My neighbor is having a garage sale over Memorial Day weekend so I'll see if he wants to put them in a freebie box. Emptied the dishwasher and everything put away. I need to do some yardwork - but really need to find a sprinkler repair person. I want to do some major cleanup and drought recovery/cleanup - but need sprinklers repaired. Today I also cleaned my brooms with soap and water. The bottom quarter of the bristles were brown and grimy. just some basics today - laundry, dishwasher, pick up around the living room. YEAH!!! The cleaning lady comes today and after my AM-Vets give away on Wednesday I'm looking forward to having the deep cleaning done. Today I'm wiping off the top of the fridge. Scary up there! I slacked off for a few weeks -- but am ready to start tackling projects again -- the next few days will be the basement after the floor drain backed up a few days ago - I guess it's a good thing that I hadn't already done it. It's an old house and we get water weeping in during the spring melt so it always needs to be scrubbed once it dries out. Also starting to sort through old paperwork -- I hoard paper. I don't know why. It's obscene. I still have the receipt from the freezer my mother gave me -- she bought it in 1982. (It still works, by the way) I have receipts for things I no longer own. I have instruction manuals for virtually every electronic or mechanical apparatus I've ever purchased dating back to 1985. And they're all in different places -- boxes, envelopes, file folders, filing cabinet, binders. Went to the attorney yesterday and got my estate planning paperwork all witnessed and notarized. Today I'm going to organize the top drawer of my rolly cart in the art room. 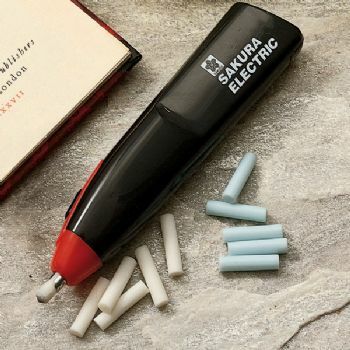 I especially need to clean out all the tiny leftover end bits of my electric eraser replacements that I was keeping in a Ziploc which I apparently forgot to zip causing them to make a mess in the drawer. spent several hours packing up all the donation items and they are all ready for pick up tomorrow. I have 2 boxes of old xmas decos that I will add also. It feels so good to free myself from this stuff. This morning I gave the personal computers a good dusting and wipe down. I also put together my grocery list for shopping later today. The goal is to only buy what's on the list. I called and got a pick up date and time for the Viet Nam Vets of America - they are coming Wed. to pick up all the stuff that I will have bagged in my driveway. This is an inspiration to get my act together and have it all ready. I have been opening every drawer and cabinet and pulling out all the things that I have been saving/hoarding for a long time. 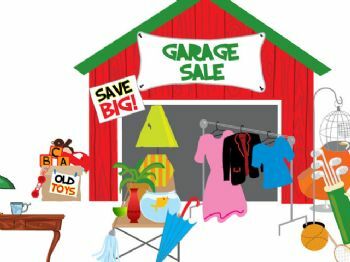 I have a large pile in my garage and I'll have it all ready for Wednesday. This feels really good to do this - plus they are coming to me to pick it up. I have to laugh at some of the stuff I have found. Cassette music tapes - and I don't even have a cassette player!!! Some old VHS movies and all kinds of stuff. even some vinyl records and I don't have a record- player either. Sheesh !!! jig-saw puzzles that I had in the hall closet and I know I will NEVER do them - they were passed on by friends. I had thought that I was good about getting rid of stuff (clothes, linens, mis-matched dishes and other kitchen stuff) - but WOW this is even more of an eye opener. I told them I would have about 3 large plastic bags full (leaf and lawn size bags), but I think I may have more than that. Like I said - this feels really good and I know that I will not miss one thing that I am donating. Washed out the kitchen and bathroom trashcans. I always line them with plastic but over time they still build up dust and an unidentified gunk. In the process of ironing Girl Scout patches to my two daughters' vests. That will allow me to put away the iron and ironing board. Today I looked through two boxes of art supplies I had packed away. My goal was to make sure I didn't reorder something I already had. But I took the opportunity to review the contents. All of the stuff in the two boxes was neatly organized and something I anticipate using in the future. So I put the boxes back on their shelf in the garage for future use. 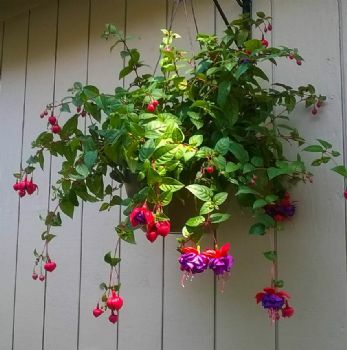 Today I swept the spider webs off the plant hanger mounted on the side of the garage so I could hang a new basket of fuchsias that I just bought at Fred Myers. Managing to keep things organized around the house. Biggest challenge is to keep all counters clear and wiped off. Today I pulled apart the fan, washed the blades, dusted the screen, and put it back together. Broke down a pile of boxes in the garage (aka known as Amazon Mountain) and threw them in the back of the car to be taken to recycle. Now I'm off to wipe down the bathroom. Have a great day everyone! Did the basics..... made bed, wiped off counters, watered some plants. Then went to my quilting group and my knitting circle. Now home and going to rest a bit before starting the laundry. 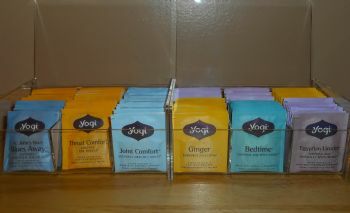 This morning I refilled and reorganized my herbal tea caddy, also making note of the quantities of my various Yogi teas to see if I needed to order any more. Sorted through a month's worth of mail, paid my bills, filed insurance documents, and shredded all sensitive documents. I keep all my mail in a pretty wicker box with a lid near the front door and deal with it once per month. It works for me. I just finished going through my bows for presents and have a bag to donate and a smaller box to keep. I use mostly bags for gifts now anyway, except for Christmas presents. Today will be spent picking up/cleaning the kitchen, dinning/living room as I am hosting my Bible study tomorrow. That includes refreshments, so need to be organized. Cleaned out the glove box in my car today.